View Poll Results: Worth getting? 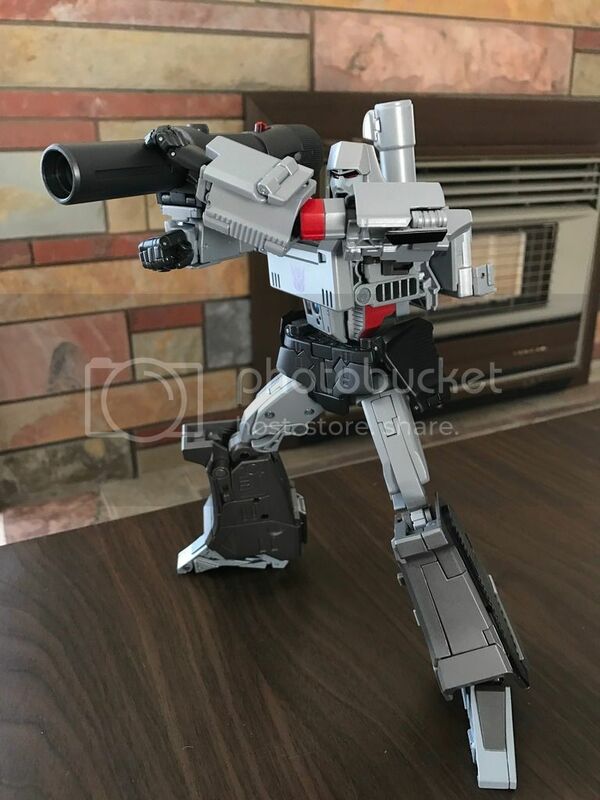 The Kiss Player dude did the concept/aesthetic design for MP-36, but who actually did the engineering design has never been revealed. Even the instructions seems to have deliberately kept the designer's identity "nameless TT employee". Judging by the style of early sketches it could well be Kobayashi himself. 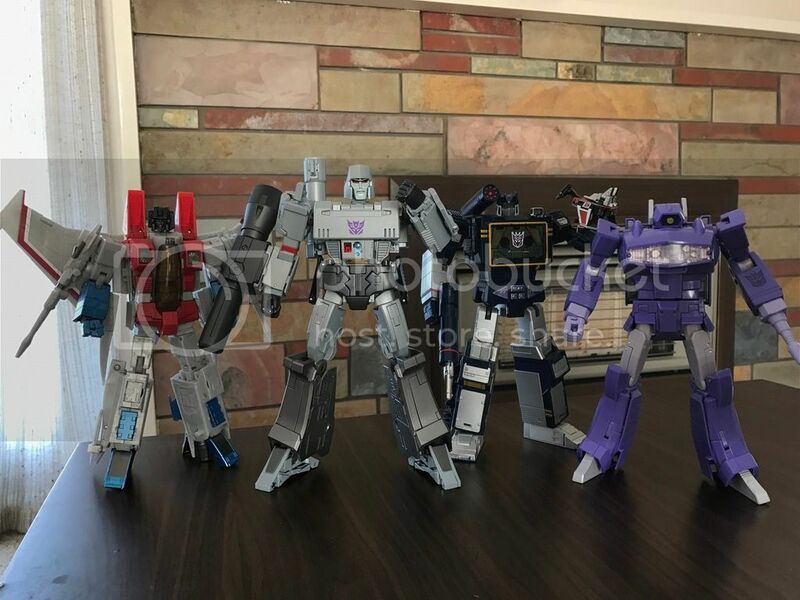 The point I'm trying to get to, is that along with the Kiss Player dude the designer(s) did one hell of a job on MP-36. I can confidently say that for myself this is the best Masterpiece figure to date. He's not perfect, but he's exactly what I wanted for a Masterpiece G1 Megatron. It is an impressive gun mode. People complain about the panel lines and I get it, but my take is that is the necessary evil. Both modes turned out great so I can live with it. Even the rifling has been sculpted. When fitting the silencer, do be careful. Take it slow and gentle to minimize the paint scratches on the gun barrel. This is a painted surface being in contact with another piece that is supposed to be a tight fit. No matter how well the paint is applied there's bound to minor paint chipping. 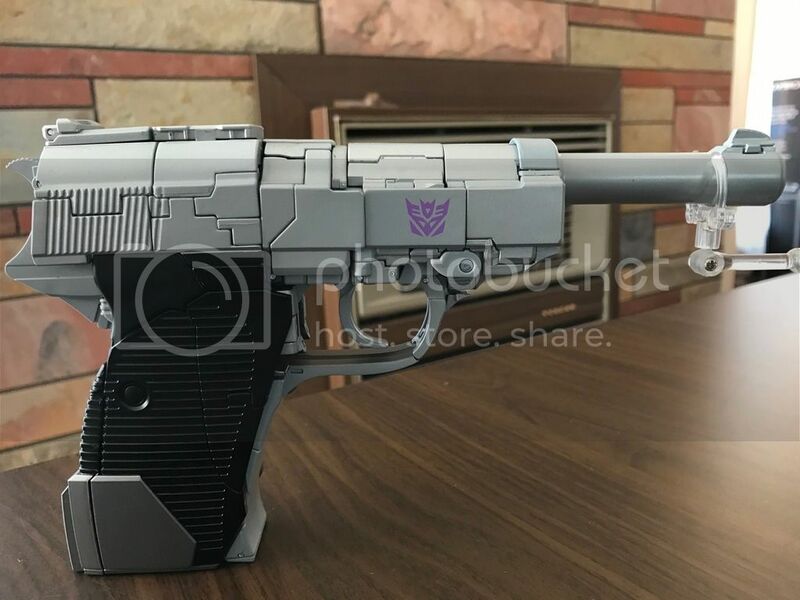 I personally don't mind it, as it gives the gun a slightly "weathered" look. 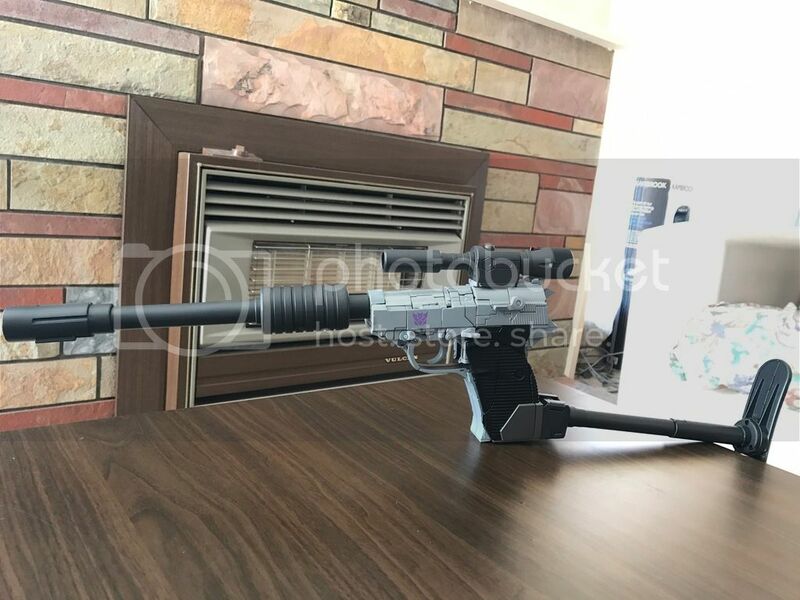 The gun has a nice solid feel to it and has a great grip. It feels just so comfortable in hand. It's a time-consuming transformation, as in it involves many steps, but I wouldn't say it's complex. 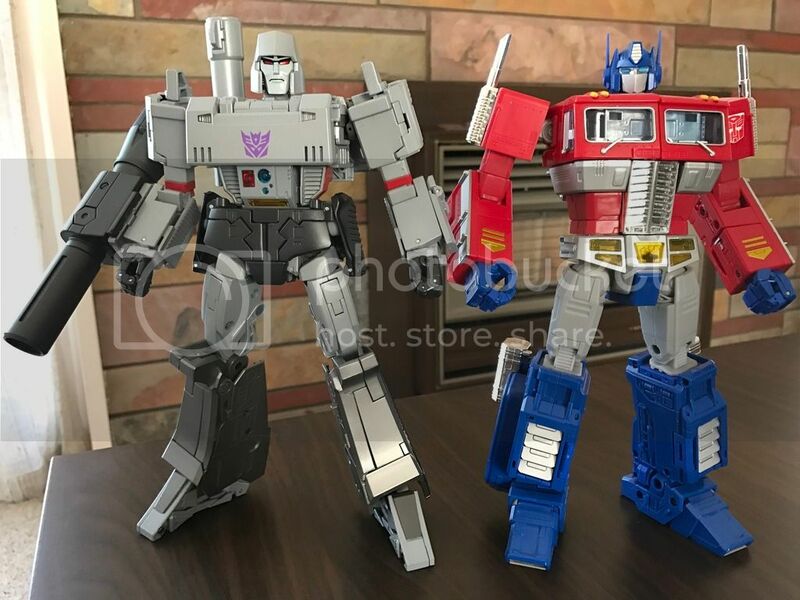 I always thought Ironhide and Megatron would be the ultimate challenges for G1 Masterpiece design. Ironhide's challenge lies in that he doesn't have much car kibble to work with in 'bot mode, while Megatron's is he needs to turn from a slim gun to a wide, bulky robot. 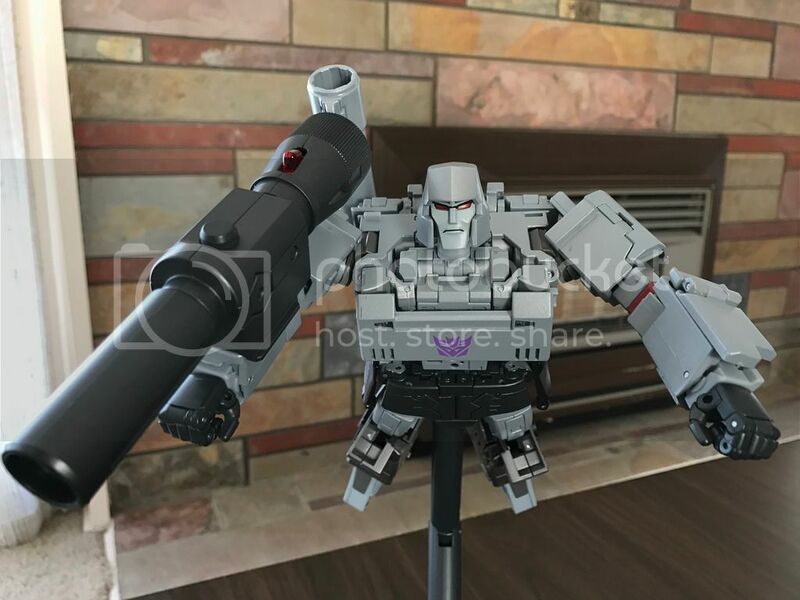 With Ironhide at least the designer has the mass/volume to work with, but Megatron would involve a lot of mass shifting/re-arranging, which would unavoidably result in large number of transformation steps(again, not necessarily complex). One major plus point for me is MP-36's transformation is divided to several chunks; you start and finish this section before moving on to the next, as opposed to having 8 million loose bits hanging around at any given moment of this process. I think you just need some practice. Take it slow first, then when you know which part goes where, you do it a lot quicker. I have transformed him 4 times and each time quicker than the last. The transformation is full of "Masterpiece moment". After handling Megs for a while I found I'm most amazed by how the gun sides of the slide do a simple twist, revealing the flat surface inside to form the shoulder. I don't like how you need to rely on the strength of the thigh joint to pull the legs apart though. It's a very tight fit and I feel like I was gonna tear the legs off every time I do it. Again, there's some paint chipping simply because of how painted parts fit together. Personally I'm not too fussed. I just be careful and apply force gently when transforming. But I won't be scared to transform it because of some minor paint chipping. 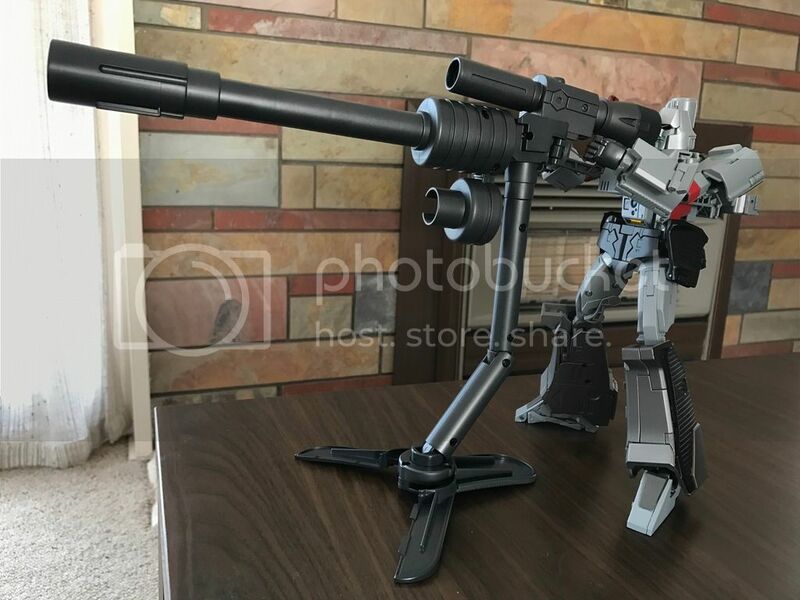 A Transformer figure is designed to be transformed (let alone one that has such a nice gun mode) and I won't have Megs as just an over-sized action figure on the shelf. The robot mode is even better than I'd ever imagined it would be. It has incredible presence and personality, and is amazingly photogenic. From the curvature of the shin, details on the back of leg, to the folded "rod piece" on the lower back carried over from the G1 toy, there's s incredible attention to detail put on this figure. And again I don't mind the backpack at all because of how accurate both modes are. 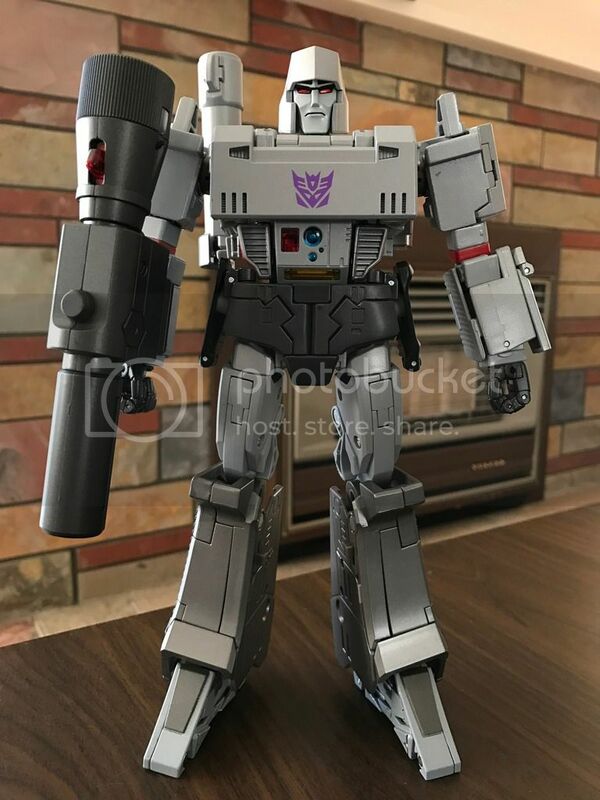 I've read comments of people disliking his proportions, but to me personally, he looks spot-on to the cartoon Megatron. In an interview about MP-10, Shogo Hasui mentioned that it took him a lot of effort to tweak the proportions to get Optimus' head right. 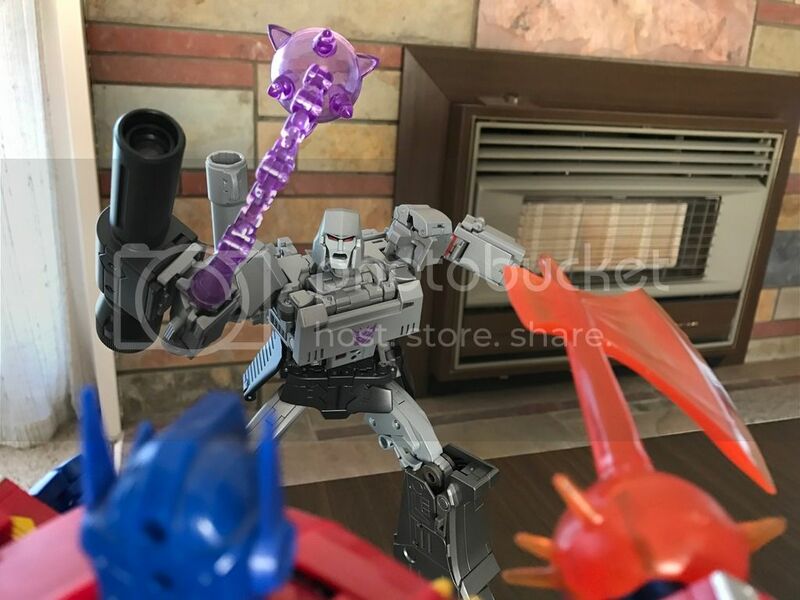 I have no doubt the designers went through the same process with Megs, to get his proportions spot-on. It's just like sculpture, it's the subtle differences that separate "likeness" and "capturing the essence". I also like the new cartoon-styled hands, with them "tube fingers". He's incredibly articulated, and very easy to pose and balance, thanks to abundance of ratchet joints, excellent joint tolerances, and die-cast parts. He's easily one of the most articulated Masterpiece figures to date. Oh, did I mention the faces. They're awesome, and they swap out with ease. The stock-turned-display stand has strong ratchet joints and is great to use with a hefty figure like this. 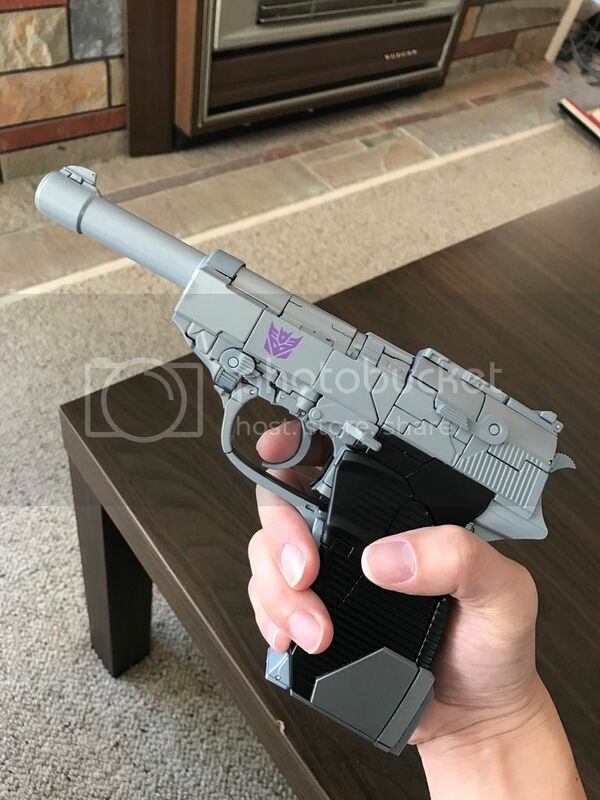 It's nice that the stock and silencer can be used the same way as they did on the G1 toy. His accessory count is not as impressive as Ironhide, but all the essential ones are included to kill a Prime or two. 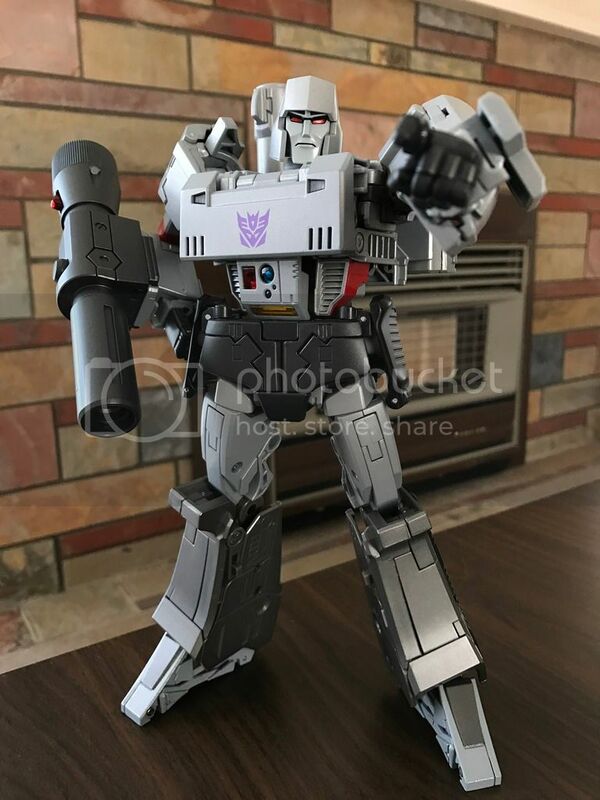 My definitive G1 Megatron, no ifs or buts. Best MP figure to date imo. Last edited by doublespy; 4th April 2017 at 07:04 PM. Great pics and review mate! In short, MP-36 is unbelievable. There's so many innovative steps to the transformation, you can tell the designer really put everything into it. I can definitely echo the difficulty pulling the legs down. Way too tight, scary even. Took me around an hour with instructions to reach gun mode the first time since I was trying to be careful. I got notification from Ohmyprimus in Singapore that mine has arrived- I've asked my brother to pick it up in person and hold it. For the record I paid about $AU 280 for mine, which is obviously more than PC ($220) but I happily pay extra for peace of mind and reliability. Mind you, I have to figure out whether to get it posted (more $$$) or wait until one of us travels (longer wait). Amazing pics! I'm reading here and on TFW about the paint chipping. Are the paint chips noticeable in robot mode? I'm planning on leaving this toy in robot mode w/ MP5 in gun mode as I believe that these are the better looking modes for both MP Megatrons. But obviously I will transform MP36 from time to time (especially at first), so I hope that I don't scratch too much. Would a spray on sealant help to make it more scratch resistant?